1. Brand new pen grinders, for the first running, few drops of #60 sewing machine oil must be added through the air pipe of the pengrinder. 2. 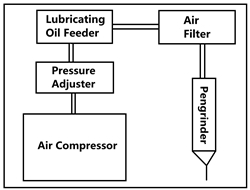 The device (shown in the left picture) for pengrinders includes Pressure Adjuster, Oil Feeder and Filter, which can prolong up to 3 times lifespans of the motors of pengrinders. 3. Lubrication is necessary for the pengrinders. 3 to 5 drops of oil per minute are given by oil feeder. Without the device, the oil of 3 to 5 ml should be added manually every 30 minutes. 4. Compressed air easily produces vapour and water. The drainage of water is important for avoiding the water overflowing from the filter to air compressor. 5. Maintenance; after cleaning, 5 ml of oil should be added to the pengrinder and keep it idling for 30 seconds to remove the vapour for the prevention of rust of some parts. 6. Bearings; the rotate speed is usually higher than the designed while running in idle, which cause the damage of the bearings. It is very important to avoid idling of the pengrinders. 7. Please wear the eyes mask while using the pengrinders. How does BMC work with metal framework to form the cover. BMC manhole cover is constructed by a moulding procedure of welding the framework of the cover with international standard deformed steel bars in a overlapping network type, then casting theframework filled with BMC (Bulk Moulding Compounds) in the mould. With the charactors of strength and hardness as metalic materials and the malleability as glass steel compounds, BMC manhole cover becomes a product of anti-pressure and weight tolerance. PRIMUS® manhole cover is a good example.